“Who of us can tell what’s real, and what’s fantastic? You do it right. No one else could have such grace.” When Paul Kelly sung those words back in 1985, he was a humble Melbourne boy who, after the collapse of his marriage, had moved to Sydney to record his first major-label album. Few could have predicted that those lyrics would one day ring true for music lovers the world over, as they reflected on the man singing them. But anyone who has ever gazed with admiration at a Paul Kelly record, or whistled one of his tunes on the way down to the beach, will attest to the fact that Kelly is more than just a singer-songwriter. In his native Australia, he’s a member of the family. He’s someone who crystallizes the spirit of a nation with the stroke of a guitar and the purr of a harmonica. He’s someone who, tactfully and effortlessly, can inhabit the skin of any Australian. Enter Charlie Owen, a rugged-looking man whom many consider one of that nation’s greatest multi-instrumentalists. Owen has worked with revered Australian artists including Don Walker of Cold Chisel, Robert Forster of The Go-Betweens, and The Cruel Sea. 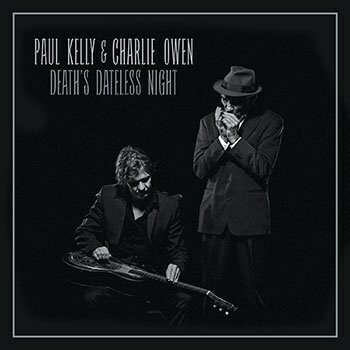 Now, as Kelly continues to expand his musical horizons in his 42nd year as a performer, he has teamed up with Owen to craft an album of funeral songs. Though it may seem an extravagant concept, Kelly been known for his creative musical projects of late. Just this year, for instance, he released an EP of Shakespearean sonnets set to music. Kelly’s career that has grown wary, though not weary, with age. These days, Adelaide-born songsmith prefers introspective, soulful concept albums to his once jangly aesthetic. While many artists retreat into arrogance in the maturity of their career, Kelly and Owen have done just the opposite; this album is comprised of tracks that others have asked them to play at funerals. The duo chose just one of the album’s tracks themselves, “Angel of Death”, a Hank Williams cover and one of Kelly’s personal favorites. Indeed, the array of different tracks on offer is what gives this album its charm; one can just imagine the stories behind each selection. From The Beatles’ “Let It Be” to Irish folk song “Parting Glass” and Leonard Cohen’s “Bird on a Wire”, Kelly and Owen draw on a rich tradition of powerful songwriting on almost every track. The power of their renditions, however, does not necessarily come from the sadness or melancholia of the tracks selected. Indeed, Death’s Dateless Night is a funeral album which does not just mourn, but celebrates, hopes, and reminisces. Look no further than the opener, a version of Stephen Foster’s “Hard Times Come Again No More”. The song tells of release, of hope, and of the beauty of the simple. Kelly and Owen do this while applying their own varnish to each track. Indeed, Kelly’s voice is unmistakable, and synonymous with understanding and dark charisma. Owen’s versatility and sensibility don’t go unnoticed either, as he provides a wealth of different musical colors without ever being obtrusive. Refreshingly, the Australian authenticity that was missing on Kelly’s earlier 2016 release, Seven Sonnets and a Song, is back on this album. Not only are there a number of different covers by some of Australia’s finest songwriters (a stirring version of L.J. Hill’s “Pretty Bird Tree” stands out here), but the duo have also re-recorded two of Kelly’s forgotten gems. Both “Nukkanya” and “Meet Me in the Middle of the Air” speak to Kelly’s ethos as a songwriter and are bolstered by a layer of emotional context.